Our unusual absence of crime last month was short lived. Our numbers for March were mostly back to normal with a little St. Pat’s bump. 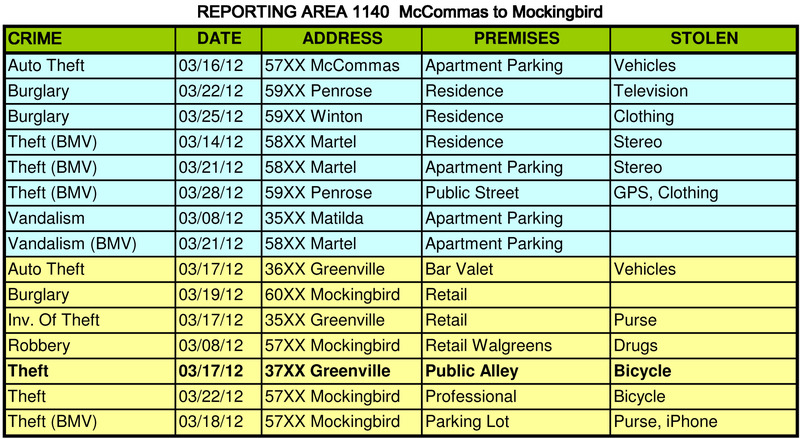 Car break-ins were up this month, mostly in the area north of McCommas and south of Belmont. These seemd to cluster around the Turtle Dove apartments and the area behind the Billiard Bar. We did have several very serious incidents this month which I detail below. 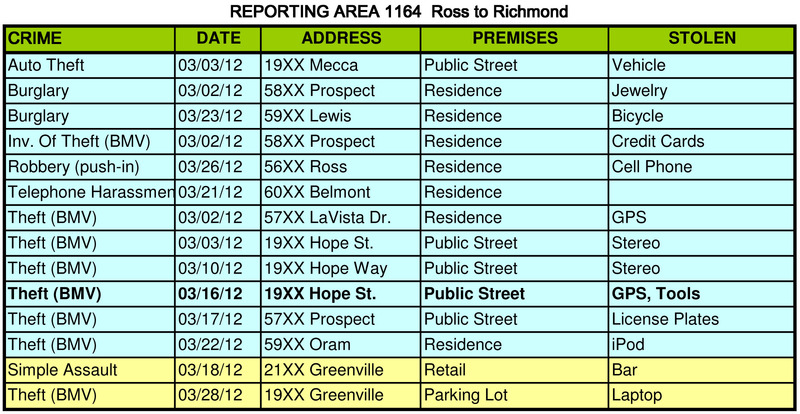 There were three robberies in our area this month that were of an aggressive nature. While these occur from time to time, they are unusual. In a incident on Mercedes, the victim was at home in the front of the house. Though the victim was present in the home, a burglar entered through an open window and stole a purse and iPad from the kitchen counter. In an incident on Morningside, a woman was returning home from a trip to the pharmacy when she was robbed at gun point in her driveway by two suspects. They got away with her purse, rings and phone. And on Ross Ave, a man responded to a knock on the door. When he opened the door, a suspect brandishing a knife pushed his way into the apartment, knocked the resident down and stole a phone and some cash from a table near the door. The suspect fled south on Matilda. Sadly, we don’t have descriptions of the bad guys on any of these incidents. At least two of these could have been avoided with simple precautions. Your home should be secure even when you are there and don’t answer the door unless you know who is there. Twice this month, someone walked in on a burglar in the act. In an incident on Winton, a realtor walked into a home after finding the front door open. She found 3 suspects searching the home with flashlights. She believes they left and went directly into the home next door. A bit of advice here… If your door has been kicked in, don’t go inside. Call 911 and wait for officers to arrive before entering. In a second similar incident, a woman on McCommas returned home to find a burglar in her bedroom holding a trashcan and a photo frame. He had entered through an unlocked rear door. She pushed him out of the apartment and then went to her car and retrieved a handgun. She then detained him until officers arrived and arrested him. Police believe the suspect was under the influence of street drugs at the time. While I’m very glad that another burglar went to jail, I’m always concerned when residents confront criminals in the act. Unless you’ve been trained on handling these situations, it’s best to leave it to the police. When there is a crime in progress, DPD’s typical response time is amazingly fast.